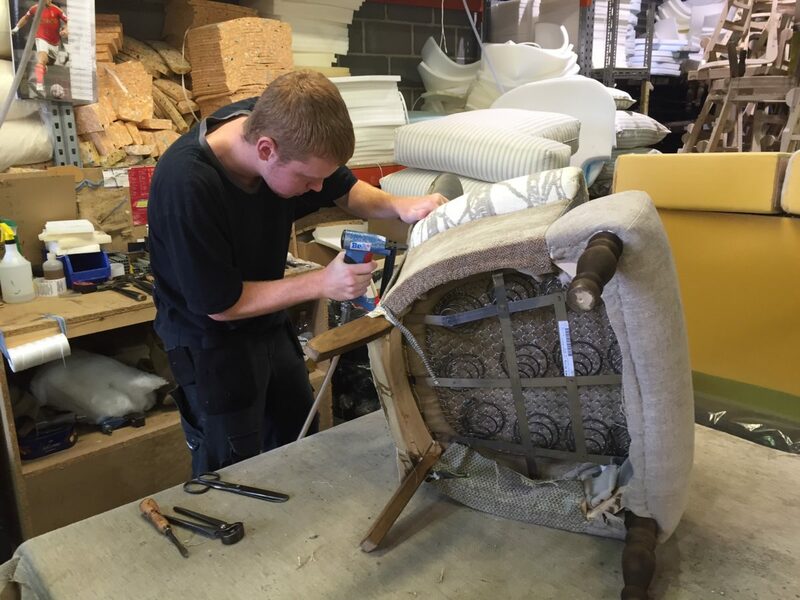 We specialise in British made furniture and were truley excited about our visit to see the best of British manufactured furniture, sofas and chairs in the workshops and showrooms of the Midlands and can now report back on what we found. We’ve some very different customer types and keep an eye out for different styles. This year we’ve found some really interesting pieces and some gorgeous fabrics and we carefully married the right sofa to the right fabric to get the right look and feel we’re after. Our customers like sofas with a curve and found one that has a real bend. The workshop model was covered in an orange leather, but we thought it would suit us better in a boucle rough weave fabric and have ordered it in burnt orange; named the Horst sofa, it will arrive mid-November and is expected to be a hit with younger families. Of course you can still order it in orange leather too! Sitting together as a family has made the corner sofa very popular. We discovered a corner suite with a Chaise Lounges end, which means you can sit it against a flat wall and it doesn’t look out of place. There’s a strong trend towards greys and silver at the moment, so we commissioned the sofa in a grey fabric. It’s a colour that works well across all ages, so will have a wider appeal in our showroom. Texture is important to create depth and a luxurious feel. We spotted an oyster chenille fabric that would look great on one of the traditional upright high seated sofas and we think it will suite people looking for a small but elegant suite. 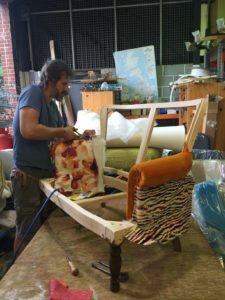 We also had time to look at the next batch of Jazzy Chairs in production – each one is pieced together by hand, so no two chairs are the same.